Christian Science is a set of beliefs and practices belonging to the metaphysical family of new religious movements. It was developed in 19th-century New England by Mary Baker Eddy, who argued in her book Science and Health (1875) that sickness is an illusion that can be corrected by prayer alone. The book became Christian Science's central text, along with the Bible, and by 2001 had sold over nine million copies. ↑ PBS, August 2008: "The church estimates it has about 400,000 members worldwide, but independent studies put membership at around 100,000." 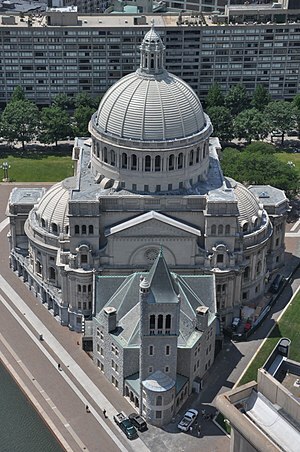 ↑ "Christian Science Center Complex", Boston Landmarks Commission, Environment Department, City of Boston, January 25, 2011 (hereafter Boston Landmarks Commission 2011), pp. 6–12. ↑ Rodney Stark, "The Rise and Fall of Christian Science", Journal of Contemporary Religion, 13(2), 1998 (pp. 189–214), p. 191. ↑ Judy Valente, "Christian Science Healing", PBS, August 1, 2008. This page was last changed on 8 June 2018, at 00:24.